Here is everything you need to know for how to put this table together! The first thing I decided I needed to do was make some signs for a few of the important features of the party! In order to do that you will need a few items (most of which you will have on hand, or have easy access to). The only thing I needed to purchase for this project was the paint. I was able to find a multi-pack at my local department store for under $10 and it came with all the colours I needed and more! 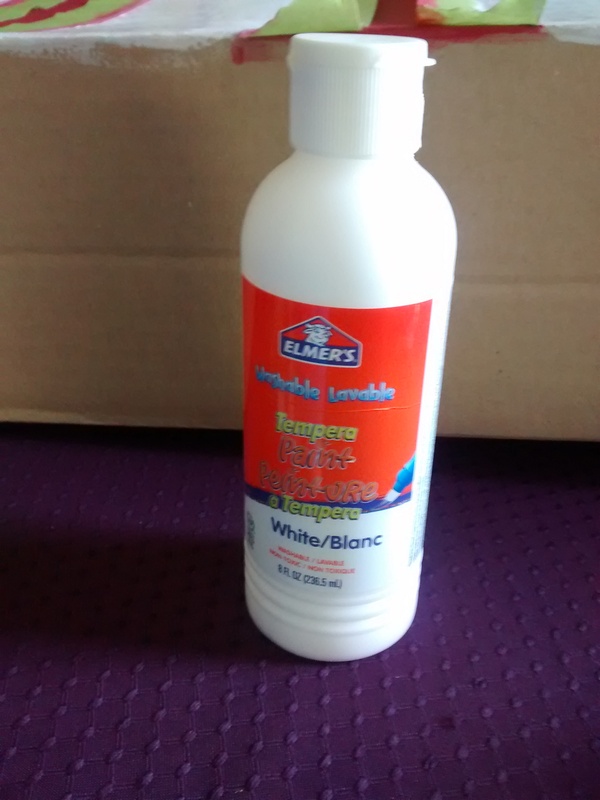 I chose to go with the Elmers Tempera paint as it is non-toxic and washable. 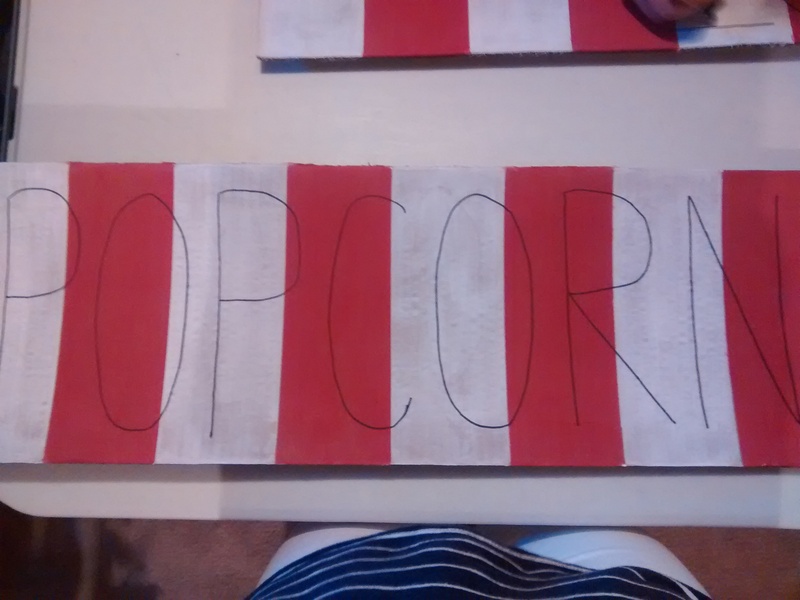 Start off by measuring out equal sections of your sign (this way you can do the funky red and white carnival stripe!). I did mine a few inches each and marked the first ones off with painters tape. Once they are marked and taped you can start painting. You will need some time and patience for this as you can only do one colour at a time (until the other is dry enough for you to put your painters tape over). The only thing I found with the tempera paint I was using was that it required a few good coats to make the colours look good. 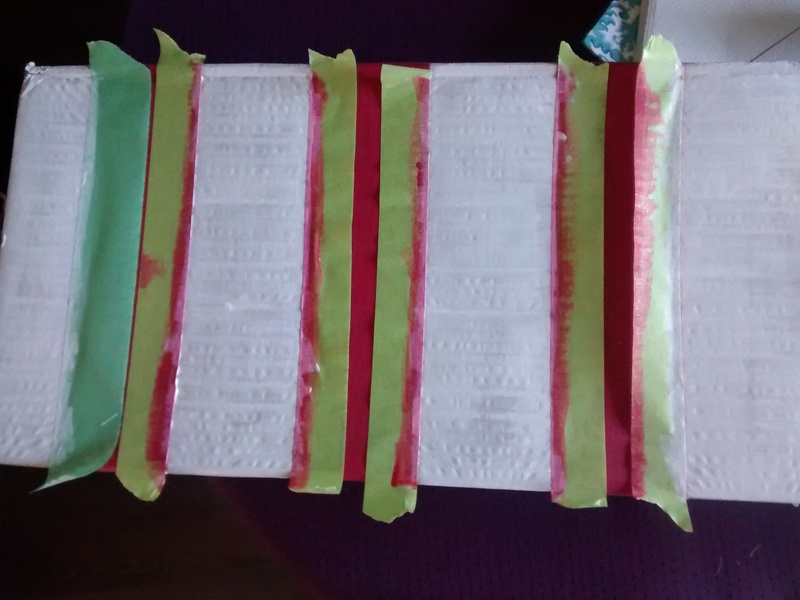 Once I was done doing the red stripes I removed the tape and reused it to mark off for my white sections. Once your paint has dried for at least 48 hours you can start on your lettering! We chose to do simple block lettering for the food signs, keeping it bold and simple! This is where I had my talented sister come over and lend me her non shaky hands! She outlined the letters for me in black sharpie marker and then we went over it with the black tempera paint until it reached the thickness we wanted! And here is the finished project! 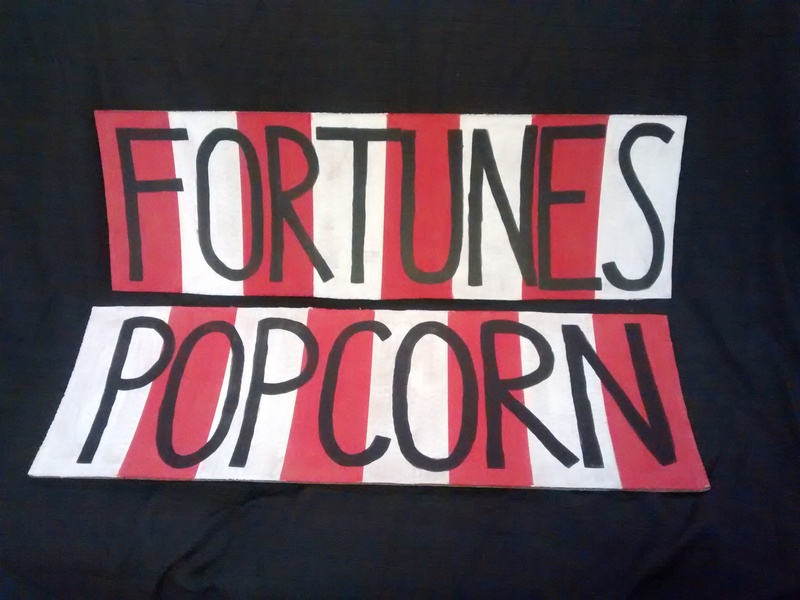 (Notice there is also a Fortune sign!? You will see why soon…). Now if you were planning on using your signs for multiple events and wanted to preserve them I would suggest purchasing a clear coat spray paint to go over them. We didn’t do this and by the next day when I dragged myself outside to start the dreaded clean up I noticed my signs looked a little weather worn (probably from sitting outside overnight, but either way, if it is something you will want again spendthe $5 and preserve them). So remember how I mentioned keeping your costs down? Here was one of the easiest ways! Instead of purchasing salted popcorn (Which I priced out at about $6/bag and I would need a few) I took it upon myself to use my popcorn maker and do it myself! I only had to buy the bag of kernels which cost me under $3 and popped away the night before! 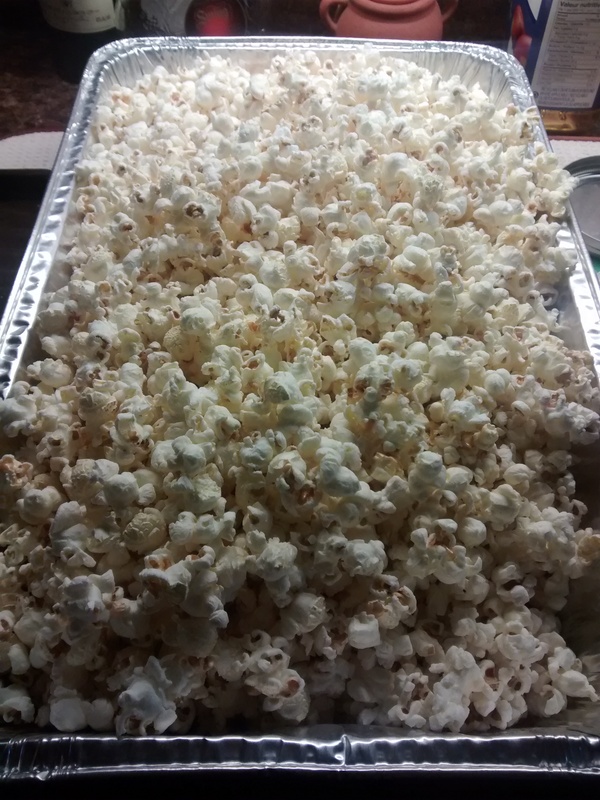 Keep in mind, you will need to keep the popcorn in airtight bags or containers overnight so it doesn’t go stale. I went to my local grocery store and took a couple of clear bags from the bakery section which worked out perfectly! In fact, it has been almost a week and the popcorn is STILL fresh!Honestly the hardest part about this was having enough willpower to not eat every batch I made! Now I do have to mention, I did purchase the Chicago Mix popcorn you see in the red pail, there was NO way I was attempting to make that the night before! The finished table ready to be devoured! I purchased some cute pails in the party colours from my local supermarket (they were on clearance for $0.94 how could I go wrong!) and got enough to use for a couple of the other things that day! 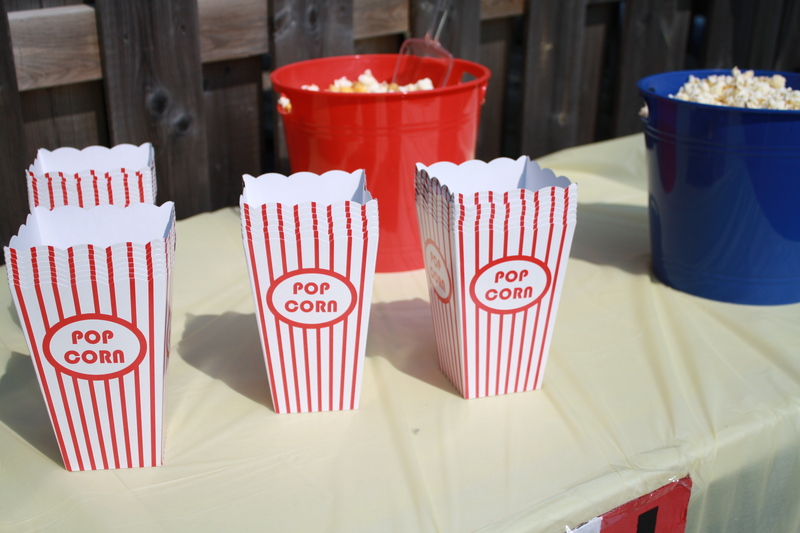 Those cute little popcorn containers you see…I got those at the dollarstore! Can you believe it?! There was 8 per package and they were $2 each (Much cheaper than anything I was able to find on Amazon/Etsy and they weren’t a flimsy material either!). To the left of the table I chose to do a couple nice bowls of in the shell peanuts, a little something extra for our guests to enjoy! I found the little red and blue bags at the craft store, remember I told you to save your coupons! Here’s a close up of the cute popcorn containers! You can go as crazy or as simple as you want with this table! If you prefer to only do salted popcorn you can always set out some fun toppings (like cheddar powder or chocolate candies) and really personalize it to your theme! 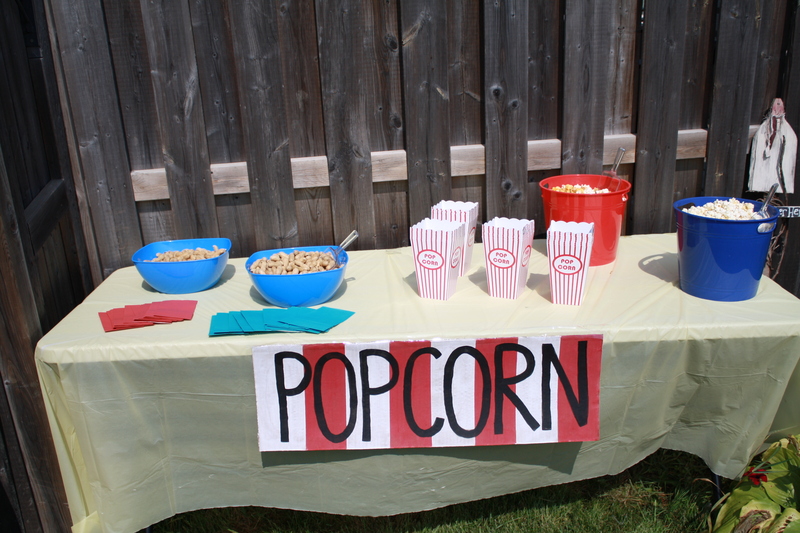 Our guests loved the popcorn table, it wasn’t just for the kiddos either! Many of the adults, myself included, had a container or two throughout the afternoon!